"If these so-called "exotic" languages die, we'll be left with just one world view. This won't be very interesting, and we'll have lost a vast amount of information about human nature and how people perceive the world. (...) [W]ithout their language and its structure, people are rootless. In recording it you are also getting down the stories and folklore. If those are lost a huge part of a people's history goes. These stories often have a common root that speaks of a real event, not just a myth. For example, every Amazonian society ever studied has a legend about a great flood. "...In English I can tell my son: "Today I talked to Adrian", and he won't ask: "How do you know you talked to Adrian?" But in some languages, including Tariana, you always have to put a little suffix onto your verb saying how you know something - we call it "evidentiality". I would have to say: "I talked to Adrian, non-visual," if we had talked on the phone. And if my son told someone else, he would say: "She talked to Adrian, visual, reported." In that language, if you don't say how you know things, they think you are a liar. This is a very nice and useful tool. Imagine if, in the argument about weapons of mass destruction, people had had to say how they knew about whatever they said. That would have saved us quite a lot of breath..."
Yeah, I think government officials and all journalists and scientists should be ordered to speak that language. Or something like it. Tariana is still spoken by some natives in the Amazon, and they now have a full dictionary thanks to Alexandra Aikhenvald. Other languages are not so lucky. About 60-70% of linguistic diversity in the north-western region of Brazil has gone in the last 100 years. On the Atlantic coast of Brazil it's about 99%. Around the world 60-70% have disappeared. English speakers might think it is hard to learn other languages, full of inconsistent rules for how one needs to pronounce things. But English is certainly no better. I got an e-mail with great examples, roughly what you find in this page. Why, oh why? Just the way it is, I guess. 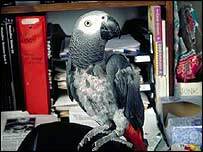 Here's the story of a rather stunningly capable parrot. He uses words in context, with past, present and future tenses, and uses humor. Are you sure that's really a parrot? If so, somebody has some explaining to do. The telepathy is particularly cool.